The Performance Loops series of loop & sample products feature real performances from professional musicians and session players, playing real instruments! Loops and samples on most of the Performance Loops series are arranged by performances. We take actual recordings from real song performances and chop them up into as many different loops, variations, fills, and hits as possible. The result is that you get more than enough loops, variations, fills, and hits to recreate a realistic performance that nobody would ever know came from a loop product. Simply chain together the loops, variations, fills, and hits in the desired order to fit your song. Or, if you are looking for that “looped” sound, you’ll have plenty of variations to choose from to find the perfect loop for your song. All loops and samples in the Wave file format products have the ACID properties pre-defined for perfecting looping with ACID, Cubase, Sonar, Adobe Audition, Ableton Live, and any other program that can read ACID loop properties. Many of our products are also available in Apple Loop Format AIFF files for Mac users, as well as Recycle 2 format RX2 files. 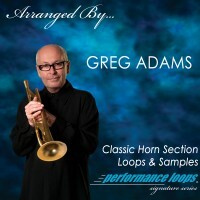 Our newest product, Arranged By… Greg Adams, is the follow up to the highly successful Greg Adams’ Big Band Brass.